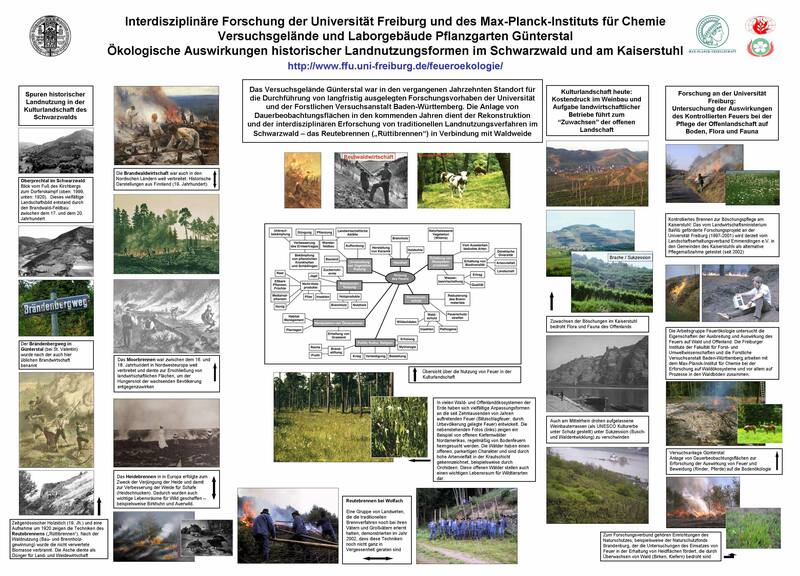 Public lecture at Heidelberg University in the frame of lecture series Quo vadis Homo sapiens: Feuer: Gestaltende Kraft von Leben und Landschaft (Fire  A Force Shaping Life and Landscape) (J.G. Goldammer); Heidelberg, Germany. International Symposium View of Northeast Asia Forest Fire from Cosmos (in conjunction with the Second Meeting of the regional Northeast Asia Wildland Fire Network), GFMC Contribution on (a) Global Wildland Fire Monitoring and (b) Lecture for Citizens “Impacts of Wildland Fires on People in Northeast Asia: Views from Space and on Ground” (J.G. Goldammer);Sendai, Japan. Second Meeting of the regional Northeast Asia Wildland Fire Network (J.G. Goldammer); Sendai, Japan. UN World Conference on Disaster Reduction (WCDR). 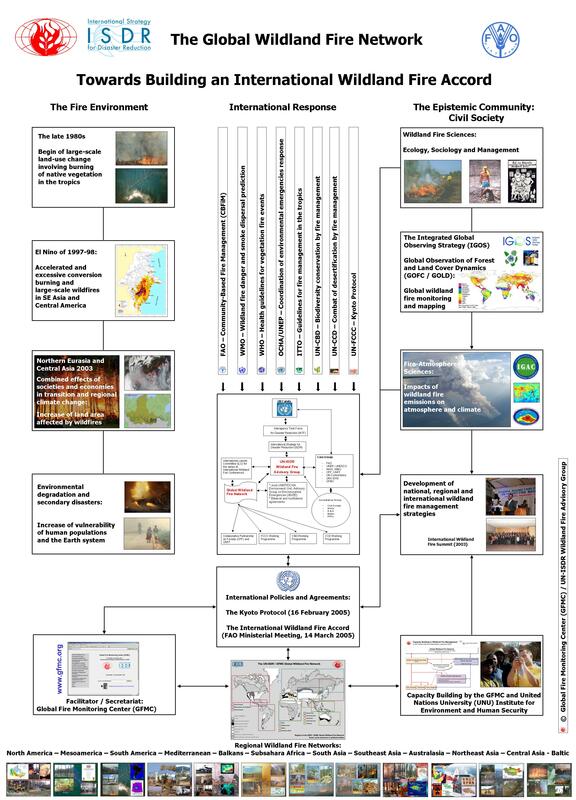 GFMC / Global Wildland Fire Network contributions jointly with the German Foreign Office / German Committee for Disaster Reduction within the ISDR and the ISDR Platform for the Promotion of Early Warning (J.G. Goldammer); Kobe, Hygo, Japan. Preparatory meeting of the experiment Use of prescribed fire in maintaininghabitats of Capercaillie (Tetraourogallis) in the Black Forest (J.G. Goldammer); Forest ExperimentalStation, Baden-Württemberg State, Germany. Third meeting of the Commission on Forest Fires, International Technical Committee for the Prevention and Extinction of Fire (CTIF) (hosted by GFMC); GFMC. Training Course of The Nature Conservancy – Fire InitiativeIntroducción a Quemas Prescritas para Áreas Naturales Protegidas (C.Scholz); Rió Bravo Conservation & Management Area, Belice. Reisepavillon 2005. Tourism and forest fires (WiePhönix aus der Asche. Waldbrände im Mittelmeerraum – natürlicherStandortfaktor oder ökologisches Risiko?). GFMCpresentation in partnership with TUI (J.G. Goldammer); Hannover, Germany. Meeting of the GOFC/GOLD Fire Monitoring and Mapping Implementation Team:Assessment of GOFC/GOLD-Fire objectives, achievementsand planning for future activities (J.G. Goldammer); Canadian Space Agency,Montreal, Canada. Meeting of the Scientific Advisory Board, Max Planck Institute for Chemistry;MPI Chemistry, Mainz, Germany. GFMC/ Regional Subsahara Wildland Fire Network (Afrifirenet) mission to Subsahara Africa, including the Intermediate and Advanced Incident Command (Incident Command System – ICS) Course, conducted by the Working on Fire Programme / GFMC / AfriFireNet (7-16 March 2005) (A. Held); Charters Creek, SouthAfrica. Meeting of the DEKLIM-Forschungsbereich Klimavariabilität und Vorhersagbarkeit- Deutsches Klimaforschungsprogramm DEKLIM des BMBF (German Climate Research Programme Climate Variability and Predictability, with GFMC Contribution on a global dataset of vegetation fires; J.G. Goldammer); Potsdam Institute for Climate Impact Reseach, Potsdam, Germany. Preparatory meeting of the Third International Conference on Early Warning (EWC-III), German Committee for Disaster Reduction within the UN-ISDR / German Foreign Office (J.G. Goldammer); Berlin, Germany. Meeting of the German National Committee for Disaster Reduction within the UN-ISDR (Deutsches Komitee für Katastrophenvorsorge – DKKV) (J.G. Goldammer); Bonn, Germany. GFMC participation at the FAO Ministerial Meeting on Forests (14 March 2005) and the 17th Session of the FAO Committee on Forestry (COFO) (15-19 March 2005), in preparation of an international accord on cooperation in wildland fire management (C. Scholz, J.G. Goldammer); FAO, Rome,Italy. Prescribed fire operation for heathland conservation in Brandenburg State, Project supported by NaturSchutzFonds Brandenburg (A. Held); Zschorno Forest, Germany. Preparation of the Subregional Mesoamerica Workshop Desarrollo de una Estrategia Regional de Cooperación para la Prevención, Control y Combate de Incendios Forestales (FAO Project TCP/RLA/3010 (C)), Oficina Regional de la FAO para América Latina y el Caribe, to be held in Ciudad de Panamá; Panamá. 24-27 May 2005 (C. Scholz); San José, Costa Rica. International Technical and Scientific Consultation Forest Fire Management in the Balkan Region conducted by the Regional Balkan Wildland Fire Network (J.G. Goldammer);Ohrid, Macedonia. Annual Seminar on Fire Ecology and Fire Management (Seminar / Kurs Feuerökologie und Feuer-Management 2004), Arbeitsgruppe Feuerökologie / Global Fire Monitoring Center, Max-Planck-Institut für Chemie, c/o Universität Freiburg; for students; course language: German; GFMC, Germany. GFMC selected as partner for the EU-PHARE Twinning Light Project HU2004IB AG02-TL Implementationof the new regulation – Forest Focus  Forest Fire, Hungary, with GermanFederal Ministry of Consumer Protection, Food and Agriculture (J.G.Goldammer, A. Held, D. Nagy, H. Abberger); to be implemented in Budapest,Hungary. Third Science and Technical Board Meeting of Global Observation of Forest and Land Cover Dynamics (GOFC-GOLD) (N.N. ); Beijing, China. Eastern European, Near East and Central Asian States Exercise on Wildland FireInformation and Resources Exchange – EASTEX FIRE 2005 with participation of the FireServices of Bulgaria (hostcountry), Albania, Bosnia& Herzegovina, Greece, Macedonia, Romania, Serbia & Montenegro, and Turkey,supported by the Global Fire Monitoring Center (J.G. Goldammer); Haskovo Region,Republic of Bulgaria. Meeting with Dr. Shashi Kumar, Director (Research), Indian Council of ForestryResearch and Education, Ministry of Environment and Forests, Government ofIndia. Discussion of foundation of the Regional South Asia Wildland FireNetwork; GFMC. 5th Session of the United Nations Forum on Forests (UNFF), with focuson an internationalarrangement on forests (16-27 May 2005).OnWednesday, 18 May, 2005, the GFMC  representing the UN-ISDR Wildland FireAdvisory Group and the Global Wildland Fire Network  organizes a side eventDevelopment of a Strategy or Agreement on InternationalCooperation in Wildland Fire Management, co-sponsored by theU.S: Forest Service and the German Foreign Office (J. G. Goldammer, 16-19 May);UN Headquarters, New York. 11thMeetingof the Inter-Agency Task Force for Disaster Reduction, UN International Strategyfor Disaster Reduction (ISDR). GMFC to report on the progress of work of theISDR Wildland Fire Advisory Group and the Global Wildland Fire Network (J.G.Goldammer); Palais des Nations, Geneva,Switzerland. Technical Sub-Regional Mesoamerican Workshop in preparation of the developmentof a Regional Strategy of Cooperation in Wildland Fire Management in LatinAmerica and the Caribbean, supported by the FAO Technical Cooperation Project TCP/RLA/3010(C) and the GFMC (C. Scholz); Panamá City, Panamá. Technical Sub-Regional Caribbean Workshop in preparation of the development of aRegional Strategy of Cooperation in Wildland Fire Management in Latin Americaand the Caribbean, supported by the FAO Technical Cooperation Project TCP/RLA/3010(C) and the GFMC (J.G. Goldammer); Santo Domingo,Dominican Republic. 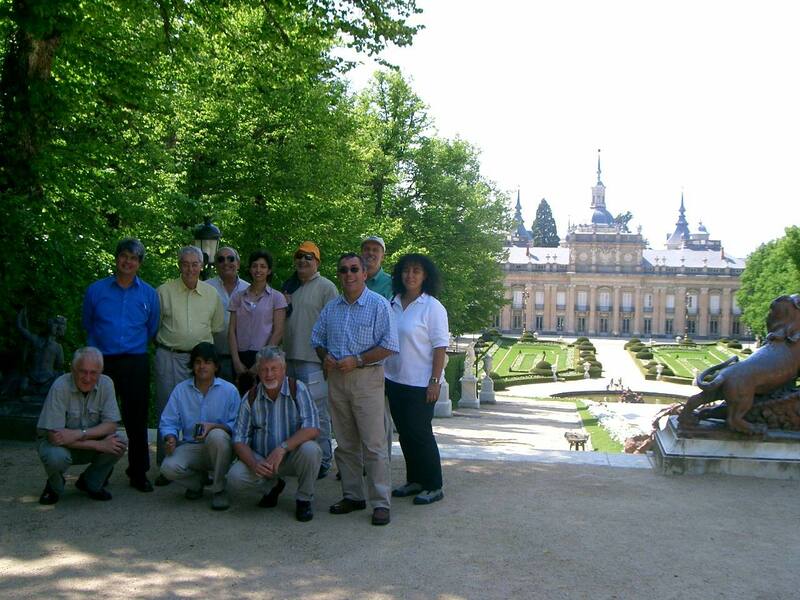 Meetings of theInternational Liaison Committee of the series of International Wildland FireConferences, in preparation of the 4th International Wildland FireConference (to be hosted by the Government of Spain, Madrid, 2007) (J.G.Goldammer); Madrid, Spain. 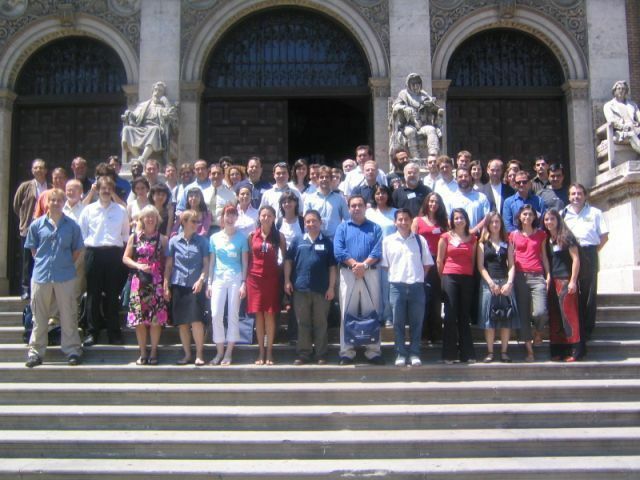 ILC Members at Segovia Castle (from left to right): Standing: Rick Sneeuwjagt (Australia), Ricardo Vélez, Jose M Solano & Mariam Sánchez (Spain), Panagiotis Balatsos (Greece), Patricio Sanhueza (Chile), Lorenza Colletti (EC); kneeling: Johann G. Goldammer (GFMC), Tiago Oliveira (Portugal), Mike Jurvelius (FAO). GFMC takes over an additional new experimental site,laboratory facility and guest house at Freiburg University; GFMC. TechnicalSub-Regional South American Workshop in preparation of the development of aRegional Strategy of Cooperation in Wildland Fire Management in Latin Americaand the Caribbean, supported by the FAO Technical Cooperation Project TCP/RLA/3010(C) and the GFMC; Curitiba, Brazil. GOFC-GOLD internationaltelephone conference (J.G. Goldammer); AT&T. Meeting of the GermanNational Committee for Disaster Reduction within the UN-ISDR (Deutsches Komiteefür Katastrophenvorsorge – DKKV) (J.G. Goldammer); Bonn, Germany. GFMC Summer party: Farewell party for GFMC staff and inauguration of thenew GFMC field station / laboratory building (see 18 July 2005); GFMC. Prescribed burning operationsfor conservation of atlantic Callunaheathlands in NW Germany (C. Scholz, D. Kraus); Lütjenholm, Schleswig-Holstein,Germany. Consultations on cooperation between the GFMC / UN-ISDR Wildland FireNetwork and the Intergovernmental Panel on Climate Change and reporting formatfor wildland fires, with visiting scientist Dr. John Raison, CSIRO, Canberra,Australia; GFMC. On-site preparation of experimental site for the use of prescribed fire inmaintaining habitats of Capercaillie (Tetraourogallis) in the Black Forest (J.G. Goldammer); Elzach Forest District,Yach, Baden-Württemberg, Germany. Consultationswith Prof. Dr. Mark Adams, BushfireCooperative Research Center (CRC), Melbourne, Australia, concerning cooperationbetween the CRC and the GFMC, and the Global Multi-Hazard Early Warning System;GFMC. Consultations on the establishment of a Forest and Fire Monitoring Centerfor Southern Chile as a sub-regional contribution to the Regional South AmericaWildland Fire Network and REDLATIF, with Dr. VictorSandoval, Universidad Austral de Chile, Valdivia, Chile; GFMC. Consultations on the an airtanker version of the BAe 146 for wildland fire suppression, withP. Lewin, BAE Systems; GFMC. Continuation of evaluationof the Max Planck Institute for Chemistry by the Scientific Advisory Board (inconjunction with review meeting on 21-22 February 2005) (J.G. Goldammer and D.Kraus); MPI Chemistry, Mainz, Germany. Preparationand kick-off meeting of the Twinning Light Project Implementation of New Regulation  Forest Focus  Forest Fire (HU2004 IB AG02-TL), with German FederalMinistry of Consumer protection, Food and Agriculture and Ministry ofAgriculture and Regional Development, Hungary, State Forest Service (J.G.Goldammer and D. Nagy); Budapest, Hungary. Preparation of experimental / demonstration prescribed burning plots inpine-heathland ecosystems of Scotland (J.G. Goldammer); Glen Tanar Estate,Aboyne, Scotland. Research programme Impacts of Fire on Balances of Soil Nutrients and their Losses to theAtmosphere in South Sumatra byvisiting scientist Dr. M. Edi Armanto, Departmentof Soil Science, Faculty of Agriculture, Sriwijaya University, Indralaya, South Sumatra, Indonesia, withUniversity of Kiel; GFMC and Kiel, Germany. Consultations with José Eduardo Pérez Pérez, Director of the Department ofEnvironment and the Voluntary Firefighters Corps (Cuerpo de Bomberos Voluntarios)of Paraguay / Regional South America Wildland Fire Network; signing of acooperation agreement between the Cuerpo de Bomberos Voluntarios and the GFMC;GFMC. Consultations with the Executive Director of the UN Environment Programme(UNEP), Dr. Klaus Toepfer, about a UNEP Strategy for reducing the environmentalimpacts of vegetation conversion fires in Southeast Asia on the environment andpublic health and safety (J.G. Goldammer); UNEP Environment House, Geneva,Switzerland. Regional Central Asia Wildland Fire Network consultation and study tour; participation at the 2nd International Junior Forestry Prize Competition and the All-Russian Forest Day (J.G. Goldammer); Irkutsk, Susdal, Moscow, Russian Federation. Prescribed burningoperations for conservation of Atlantic Calluna heathlands on SyltIsland, NW Germany (D. Kraus); Sylt Island, Schleswig-Holstein, Germany. Fire Management Study Tour of a Hungarian delegation to Germany in the frame ofthe Twinning Light Project Implementation of New Regulation  Forest Focus Forest Fire (HU2004 IB AG02-TL). Participants: Mr.Zsolt Szilagyi, Mr. Zoltan Kovacs, Mr. Attila Horicsany, Mr. Sandor Varga, Mr.Peter Debreceni (D. Nagy, A. Held); Brandenburg State, Braunschweig, Freiburg,Germany. Kick-off meetings of the Community-Based Fire Management (CBFiM) Pilot Projectin Central Mozambique in the frame of the Regional project IntegratingVulnerability and Adaptation to Climate Change into Sustainable DevelopmentPolicy Planning and Implementation in Southern and Eastern Africa,co-sponsored and implemented by UNEP, the AfricanCentre for Technology Studies [ACTS], the International Institute for Sustainable Development [IISD], the GermanAgency for Technical Cooperation [GTZ] and technically and scientificallysupported by GFMC (J.G. Goldammer); Maputo, Beira and Gorongosa, Mozambique. Signing ceremony of an agreement between the United Nations University (UNU) andthe Max Planck Institute for Chemistry / Global Fire Monitoring Center (GFMC)for functioning of the GFMC as an Associated Institution of the United NationsUniversity (J.G. Goldammer, M.O. Andreae, J. A. van Ginkel, J. Bogardi); UNUInstitute for Environment and Security (UNU-EHS), Bonn, Germany. Group photograph From left to right: Prof. Andreae, Max Planck Institute forChemistry; Prof. Johann G. Goldammer, GFMC; Prof. Janos Bogardi (UNU-EHS); Prof.Hans Van Ginkel, UNU Rector; Günter Klein, UNU Consultant. Civil Protection & Public Health Workshop of the Global Monitoring forEnvironment and Security (GMES) (D. Kraus); European Space Agency, Brussels,Belgium. Multi-Stakeholders Workshop Strengthening of the UNISDR as a tool tofacilitate the implementation of the Hyogo Framework for Action (K.-O. Zentel, DKKV, for J.G. Goldammer); International Environmental House, Geneva, Switzerland. Fire Recognition Satellite System (FIRES) User Workshop, German Aerospace Center(DLR) (J.G. Goldammer); Berg, Germany. Visit of Jomo G. Mafoko, Senior Scientific Officer,Agricultural Resource Board, Ministry of Environment, Wildlife andTourism, Botswana; GFMC. Steering Committee meeting of the Twinning Light Project Implementation of New Regulation  Forest Focus  Forest Fire (HU2004 IB AG02-TL), with German FederalMinistry of Consumer protection, Food and Agriculture and Ministry ofAgriculture and Regional Development, Hungary, State Forest Service (J.G.Goldammer and D. Nagy); Budapest, Hungary. Meeting of the German National Committee for Disaster Reduction within theUN-ISDR (Deutsches Komitee für Katastrophenvorsorge – DKKV) (D. Kraus); Bonn,Germany. Regional Meeting on the Development of a Regional Strategy for InternationalCooperation in Wildland Fire Management in Latin America and the Caribbean (FAOProject TCP/RLA/3010  C, supported by the GFMC) (J.G. Goldammer); Santiago;Chile. Work visit of Brian J. Stocks, Canadian Forest Service, on multilateral wildlandfire research and wildland fire research related to the Kyoto Protocol; GFMC. Final meeting of the General Purpose Study Scientific Assessment of Spaceborne High Temperature Event (HTE) Observing Mission Concepts (ECOFIRE)conducted by the German Aerospace Center (DLR) and supported by GFMC (J.G.Goldammer); European Space Agency (ESA) / EuropeanSpace Research and Technology Centre (ESTEC ), Noordwijk, Netherlands. 12thMeetingof the Inter-Agency Task Force for Disaster Reduction, UN International Strategyfor Disaster Reduction (ISDR). GMFC to report on the progress of work of theISDR Wildland Fire Advisory Group and the Global Wildland Fire Network (J.G.Goldammer); Palais des Nations, Geneva,Switzerland. 5th Symposium – International Symposium on Forest Fire Protection, NationalResearch Institute of Fire and Disaster (NRIFD) (D. Kraus); Tokyo, Japan. Preparatory meeting for the 3rd Meeting of the Regional NortheastAsia Wildland Fire Network, in tandem with the 5th Symposium – InternationalSymposium on Forest Fire Protection, National Research Institute of Fire andDisaster (NRIFD) (D. Kraus); Tokyo, Japan. 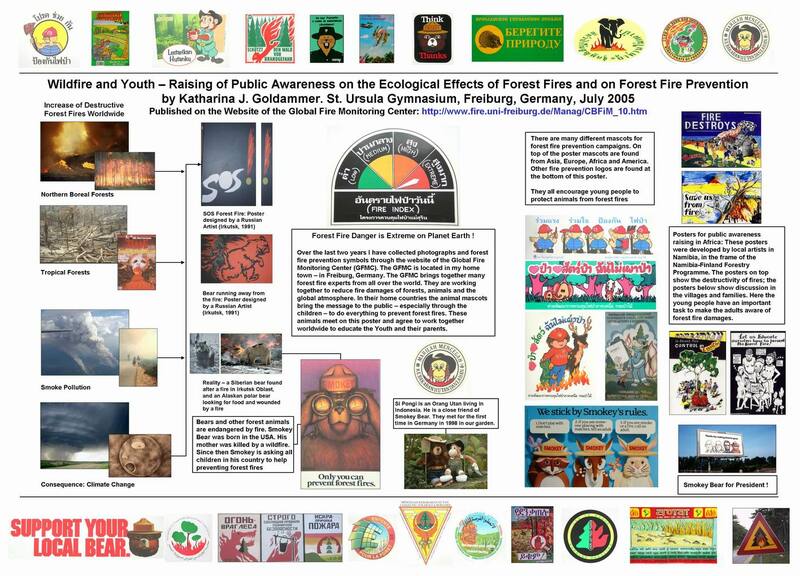 Consultations with FAO Forest Department on the development of VoluntaryGuidelines for Fire Management and the Strategy for International Cooperation inWildland Fire Management (J.G. Goldammer); FAO Rome, Italy. ACCENT / GEIA Workshop How to access global andregional burnt biomass from satellite observations to derive gases and particleemission inventories? (D. Kraus); Toulouse, France. Preparatory meeting for the Third International Early Warning Conference (EWC-III)(J.G. Goldammer); Geoforschungszentrum Potsdam, Germany.